From a country whose fledgling metal scene has yet to garner any global acclaim (that's the Philippines) are the five souls who comprise Bloodshedd. Having a rather obscure debut to their credit so far, the band recorded and released this sophomore album in record time lest inertia get the better of them. 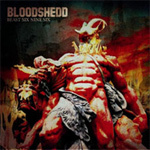 Their own brand of death metal is far removed from the usual deep grunts and avalanche of blastbeats (well, there are blastbeats here but...), Bloodshedd are on the grittier side, delivering songs that are equally fast-paced and complex, just try Collective or And They Thought of Pastures. This album, originally titled Beast 696 then changed at the last minute, starts with a brooding intro where an inaudible buzz grows and grows before the first song This Lifelong Emnity arrives in a gaggle of grating riffs. While the production values here is decent enough, there's a peculiar aspect of Bloodshedd that truly sets them apart from every by-the-numbers death metal unit out in the market these days. For starters, Jojo Book's vocals are distinctive; his furious incantations belong to the higher register of extreme growls. More like shrieks than unsolicited homage to Cookie Monster. Think Chuck Schuldiner meets Jeff Walker meets the At The Gates dude. Schooled in the eternal verities that make metal orgasmic, twin guitar madness afflicts most of the songs. Even better, these guys have found the time to explore other genres and usually open the guitar solos with touches of jazz fusion. Go straight to Collective and hang on till the second chorus wraps, there. All of a sudden, these gentle notes slide in and stew for a few seconds until its bumped aside by a ripping guitar duel between Bong Ecat and Bike Buick. But the real agent of chaos here is Toots Book, Jojo's bro, who works the drums with a vengeance. Throughout, the man never flinches from the complex stuff. It's just devastating. For more twists in our musical expectations, Spare No One, This House of Termites, and the chaotic finisher Point Blank Target On God are this album's meatier offerings. They coexist with intensely paced numbers like Beast 696, Destroy Heaven and Time For You To Die. For a genuine taste of Filipino metal, take a huge bite off Bloodshedd's latest. Be warned though, it'll take a few spins to get a solid grip on this beast. For a genuine taste of Filipino metal, take a huge bite off Bloodshedd's latest. Be warned though, it'll take a few spins to get a solid grip on this beast.